The wish of late actor James Doohan — a.k.a Scotty in Star Trek — has finally come true: His ashes have been “beamed” to outer space. 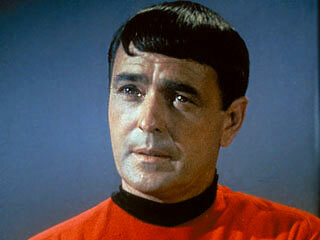 Doohan died July 20, 2005, from pneumonia and the effects of Alzheimer’s disease. In his will, Doohan requested that his ashes be launched into outer space — and, on at least two different occasions, that almost happened. In 2007, his ashes were aboard a spacecraft that briefly entered outer space before returning home, as planned. More than a year later, a similar mission was embarked upon, but the rocket failed quickly after takeoff. Delays and rumors have followed ever since, but early Tuesday morning, Doohan’s ashes were finally, and successfully, flown into outer space via SpaceX’s unmanned Dragon spacecraft, which is expected to dock with the International Space Station sometime over the next few days. “We are carrying the ashes of several people, and I am told [Doohan] is in there,” billionaire SpaceX founder and CEO, Elon Musk, told Mashable. Scotty, you’ve been beamed! ‘The Avengers’ Passes ‘Star Wars’ at the Box Office!